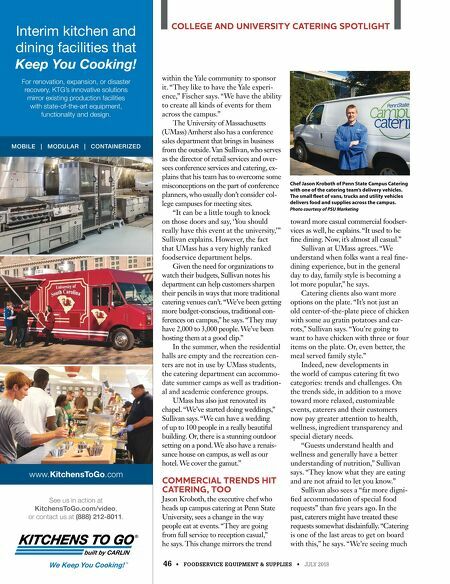 JULY 2018 • FOODSERVICE EQUIPMENT & SUPPLIES • 47 better treatment of folks who ask for something that won't kill them!" Penn State's Kroboth adds, "Twenty years ago, you might have had a peanut allergy to worry about at an event. Now, with a party of 200 people, you are wor- ried about nuts, soy, eggs, gluten and whatever. When I do a menu with 8 or 10 items, I try to make sure there are things for vegans, vegetarians, and guests who avoid gluten, nuts, and dairy." Alina Carcea, director of UMass catering, says her team asks clients about allergies ahead of time. "The other night, we had people who are al- lergic to mushrooms. We had a risotto with mushrooms, so we had to make some without. Some may be allergic to tomatoes, so we have to have a salad without them. We're able to accommo- date that if we know in advance." 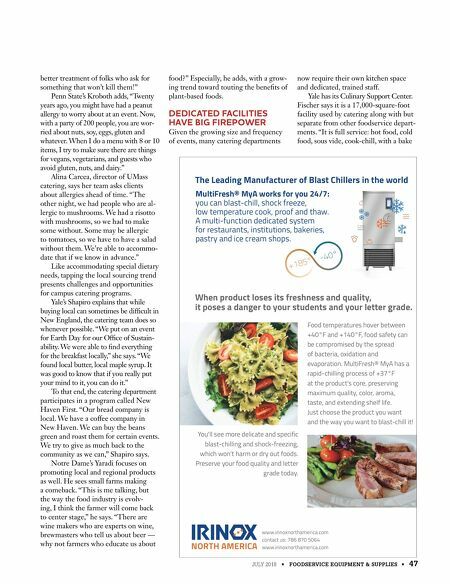 Like accommodating special dietary needs, tapping the local sourcing trend presents challenges and opportunities for campus catering programs. Yale's Shapiro explains that while buying local can sometimes be difficult in New England, the catering team does so whenever possible. "We put on an event for Earth Day for our Office of Sustain- ability. We were able to find everything for the breakfast locally," she says. "We found local butter, local maple syrup. It was good to know that if you really put your mind to it, you can do it." To that end, the catering department participates in a program called New Haven First. "Our bread company is local. We have a coffee company in New Haven. We can buy the beans green and roast them for certain events. We try to give as much back to the community as we can," Shapiro says. Notre Dame's Yaradi focuses on promoting local and regional products as well. He sees small farms making a comeback. "This is me talking, but the way the food industry is evolv- ing, I think the farmer will come back to center stage," he says. "There are wine makers who are experts on wine, brewmasters who tell us about beer — why not farmers who educate us about food?" Especially, he adds, with a grow- ing trend toward touting the benefits of plant-based foods. DEDICATED FACILITIES HAVE BIG FIREPOWER Given the growing size and frequency of events, many catering departments now require their own kitchen space and dedicated, trained staff. Yale has its Culinary Support Center. Fischer says it is a 17,000-square-foot facility used by catering along with but separate from other foodservice depart- ments. "It is full service: hot food, cold food, sous vide, cook-chill, with a bake MultiFresh® MyA works for you 24/7: you can blast-chill, shock freeze, low temperature cook, proof and thaw. A multi-function dedicated system for restaurants, institutions, bakeries, pastry and ice cream shops. When product loses its freshness and quality, it poses a danger to your students and your letter grade. Food temperatures hover between +40°F and +140°F, food safety can be compromised by the spread of bacteria, oxidation and evaporation. MultiFresh® MyA has a rapid-chilling process of +37°F at the product's core, preserving maximum quality, color, aroma, taste, and extending shelf life. Just choose the product you want and the way you want to blast-chill it! The Leading Manufacturer of Blast Chillers in the world +185° -40° www.irinoxnorthamerica.com contact us: 786 870 5064 www.irinoxnorthamerica.com NORTH AMERICA You'll see more delicate and specific blast-chilling and shock-freezing, which won't harm or dry out foods. Preserve your food quality and letter grade today.